Accidents at work. The first 10 minutes are crucial. By the end of September 2017, more than 56,100 persons were injured as a consequence of accidents at work. According to the data of the Central Statistical Office, the most accident-prone sectors included industrial processing, trade, transport, storage, and construction. Due to their inability to work, employees collectively spent more than 1.8 million days on sick leaves – this is more than 33 days per one injured person. In many situations, the consequences of the accident could have been much less serious if appropriate aid was provided immediately. Human health and lives frequently depend on whether employees (or witnesses of an accident) are able to react properly and provide first aid. According to the report by the Central Statistical Office, the number of people who suffered serious accidents at work increased by 18 percent when compared to the previous year. The injuries included loss of sight, hearing, speech, incurable diseases, as well as total or partial inability to work in their profession. Moreover, the number of fatal accidents increased by 12 percent, compared to the same period last year. According to statistics, up to 25 percent of accidents at work occur during movement, followed by handling of objects (almost 17%), and – in the third place – manual transport (nearly 15%). Accidents at work are often the result of underestimating safety standards and perpetuating bad habits while performing tasks. Our vigilance is also often lowered by routine and repeatability. Therefore, it is so important to build awareness of potential risks among employees, and a sense of responsibility for their own safety and that of their colleagues. However, this awareness must be accompanied by actual knowledge and practical first aid skills. What first aid skills should employees have? Injuries to employees are most frequently caused by contact with a stationary or moving objects, as well as with a sharp, rough or harsh objects. The upper and lower limbs, as well as the head, are the most susceptible to injuries. Employees should know how to immobilise fractures, stop haemorrhage and bleeding, dress wounds, deal with the victim after a spinal injury, what to do in case of burns and electric shocks, and how to react in case of breathing problems. 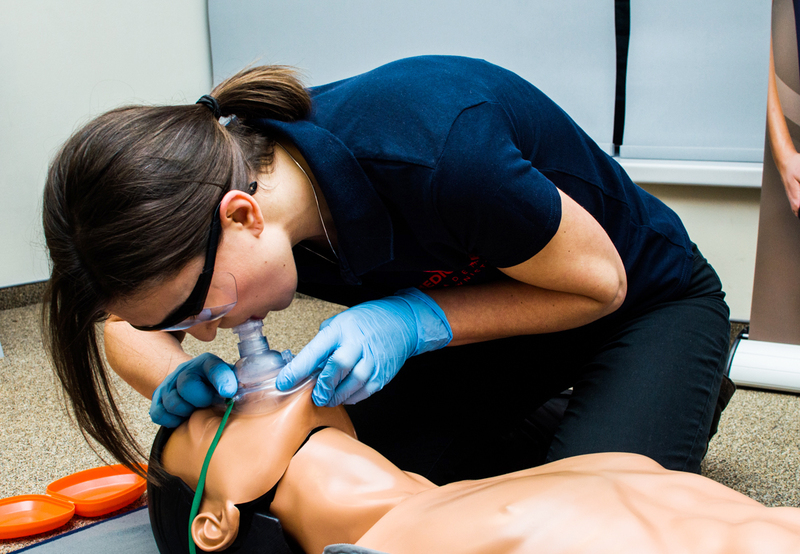 In terms of saving lives, the most important skill is to perform a cardiopulmonary resuscitation (CPR) procedure. This should be done for victims of cardiac arrest. For adults, this involves 30 chest compressions, followed by airway clearance and two rescue breaths. From the moment of cardiac arrest, we have about four minutes to begin CPR – after this time, oxygen-depleted brain cells die. Unfortunately, in Poland the percentage of people who recover from cardiac arrest is very low. This is because instead of beginning rescue operations, witnesses just wait for an ambulance to arrive. When choosing first aid training for employees, you should focus on several aspects. Classes should be conducted by experienced instructors who, in addition to having experience and substantive knowledge in the field of rescue operations, are trained in how to teach such courses. 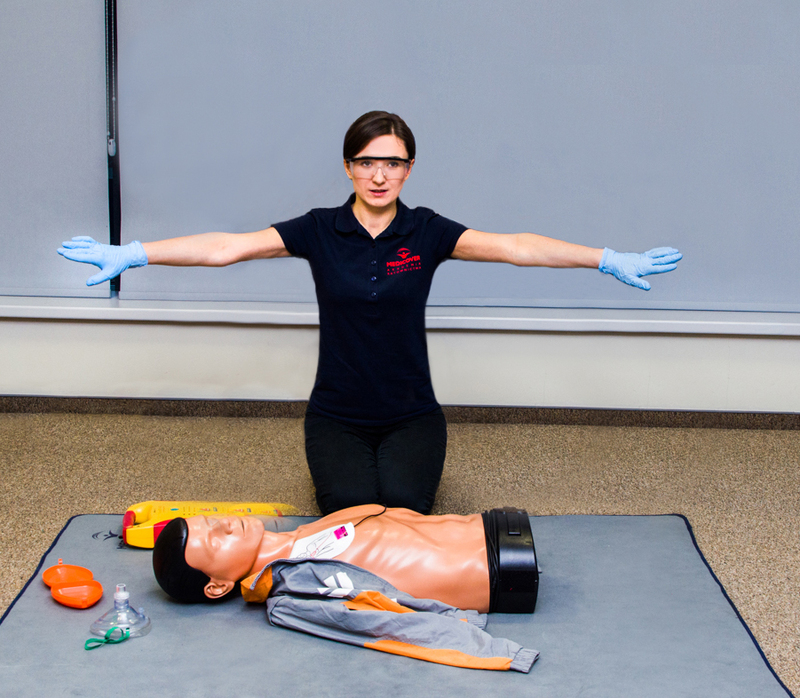 Moreover, please pay attention to the equipment used by the staff during the training – the participants should be trained using mannequins, AED defibrillators, orthopaedic collars and spinal boards, as well as equipped first aid kits that meet the necessary requirements. The training must provide participants with practical skills. Only this way gives a chance that in a real emergency situation they will be able to provide help properly. During the classes conducted at the Medicover Rescue Academy, instructors make use of exercises and simulations that, by imitating realistic events, allow participants to test themselves in action, including the conditions under controlled stress.